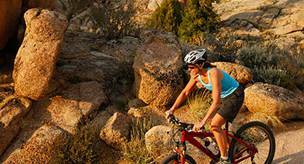 Enjoy a guided tour on some of Arizona's best trails, located just pedaling distance from the Boulders Resort. 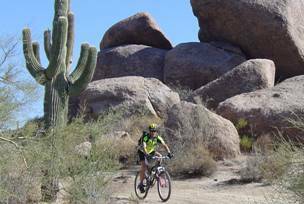 The rolling desert terrain is both challenging and fun, while the scenery is unforgettable. 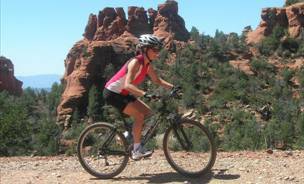 Our mountain bikes are full-suspension models with disc brakes. We'll also supply the helmet, water bottles, and some expert riding tips. cleat-shoe pedals, just bring yours along! Night-riding is a great outdoor adventure. The desert comes alive at night as we cruise along the resort’s roller-coaster golfcart paths by the light of high-tech LED systems. off-road bike riding without a guide.